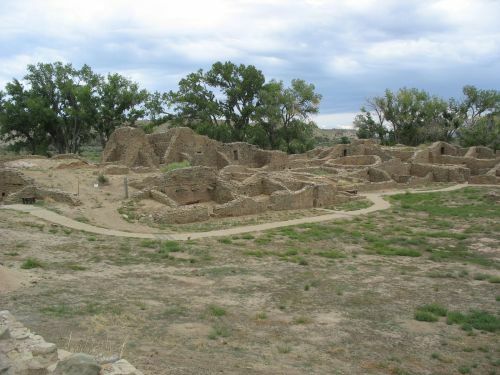 So far in this series of posts on “tracing the connections” between ancient Pueblo sites like Chaco Canyon and modern Pueblos, I’ve discussed evidence from linguistics and folklore, but of course if the issue is determining which modern groups are physically descended from which ancient ones it’s hard to beat evidence from actual physical remains. Physical anthropology has been somewhat less emphasized in the history of Southwestern anthropology, especially compared to archaeology and ethnography, but there has been a fair amount of this kind of research over the years and it is clearly at least potentially useful in answering these questions. These days when people talk about physical evidence of genetic connections they often mean DNA, and there have been several interesting recent studies of the DNA of both ancient and modern Southwestern populations that are relevant to my present concern. That topic deserves its own post, however (which I am working on), so for now I’m going to focus on a more “traditional” type of physical anthropological study: the statistical comparison of skull features and measurements. This sort of study generally takes the form of measuring various attributes of skulls from different archaeological excavations and comparing them statistically to see which ones pattern together. (There are also studies of non-metric features that work somewhat differently, but here I’m going to focus on studies of metric features.) I’m always a bit dubious about the relevance of these studies, since I’m not sure how clear it is that the traits they’re measuring really do correlate with genetic relatedness, but this is a well-established and longstanding field of inquiry so for now I’ll take it as given that the underlying theoretical assumptions are well-founded. 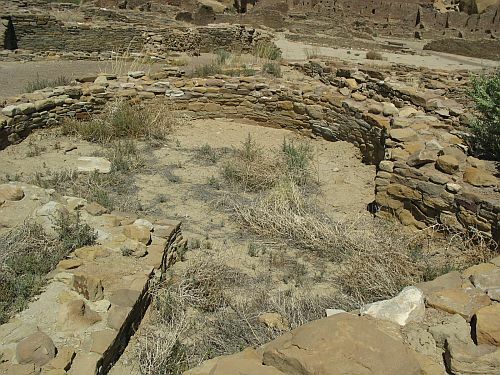 Turning to Chaco specifically, the most influential studies along these lines are those done by Nancy Akins as part of the Chaco Project in the 1970s and 1980s. It was her work that famously concluded that the two main burial populations in Pueblo Bonito, in the northern and western parts of the site, were most similar not to each other but to two different small house sites elsewhere in the canyon. This was an important finding, in that it implied that the population inhabiting the canyon in its heyday was physically diverse in ways that didn’t necessarily pattern with geographical settlement patterns. This in turn implies that there may have substantial diversity in ethnic and linguistic backgrounds among different Chaco residents as well, an implication that some other lines of evidence also support. Schillaci and Stojanowski argue that while it’s certainly possible that the matrilocal western Pueblos of Hopi and Zuni are descended in part from the Chacoans, it’s not at all obvious that they have a better claim to such descent than the eastern Pueblos of the Rio Grande Valley, which are generally either patrilocal or bilocal (couples live with either set of parents). To test this idea, they take Akins’s data from Chaco and compare it to measurements made according to the same protocol on several other contemporaneous and later Pueblo populations. These include Village of the Great Kivas, a Chacoan outlier in the Zuni area, as well as Hawikku, a much later ancestral Zuni site. They also include several samples from the Rio Grande area, both contemporary with Chaco and later. Of the other Chaco samples, the western burials at Pueblo Bonito cluster most closely with those from both Hawikku and the ancestral Tewa site of Puye in the Rio Grande Valley. The burials from the small sites in the Fajada Butte area at Chaco pattern most closely with the ancestral Tewa site of Tsankawi, and in fact these two form a somewhat distinct group compared to most of the other samples. Finally, the burials from the small sites of Bc 51 and Bc 53, on the south side of the canyon across from Pueblo Bonito, pattern closely with those from Picuris, a Northern Tiwa Pueblo which is still occupied, as well as with those from the ancestral Tewa sites of Sapawe and Pindi. Schillaci and Stojanowski conclude from this that there is no good reason to conclude that Chacoan society was matrilocal based on the practices of the likely descendants of the Chacoans, among whom they have identified both eastern and western Pueblos practicing various forms of postmarital residence. They do acknowledge that they weren’t able to include any Hopi samples in the analysis, so the western Pueblos are represented only by the two Zuni-area sites, which leaves open the possibility that the Hopis are closely connected to Chaco, which would strengthen Peregrine’s position and weaken theirs. 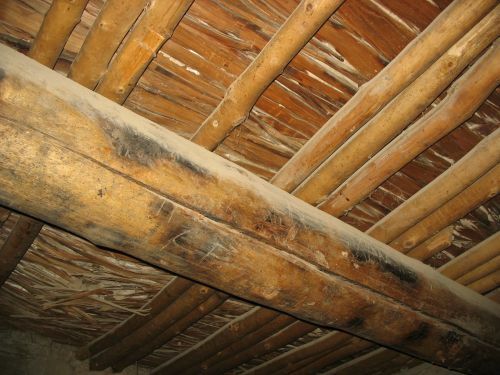 On the other hand, other lines of evidence suggested somewhat weaker ties to Chaco among the Hopis than among most other modern Pueblos, so this probably isn’t a major problem. In his response, Peregrine notes the possibility that bilocality among the eastern Pueblos is a post-contact development related to declining population and therefore not necessarily relevant to the prehistoric evidence. He doesn’t challenge the overall validity of the analysis, however, which is our main concern here. This is an interesting study, and it identifies some later sites with at least a high probability of including people descended from the Chacoans, but the facts that these sites don’t particularly pattern with each other and that there was considerable diversity within Chaco itself point to how complicated the picture seems to be. 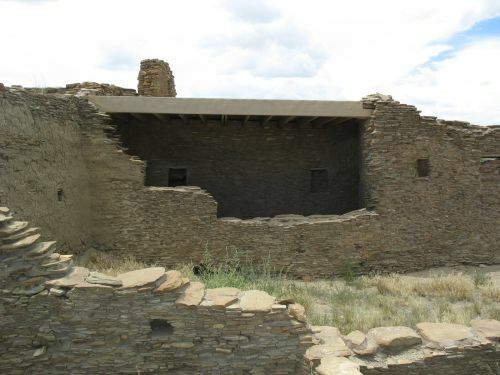 Overall, this evidence seems to support the idea that most of the modern Pueblos include at least some people who are descended from the Chacoans, and it provides particular support for such ties among the Zuni, Tewa, and Northern Tiwa. It also supports the previously existing evidence for considerable population diversity at Chaco itself. As we’ll see in the next post, this is not very different from where the DNA evidence leads. One of the most interesting and potentially productive lines of research in Southwestern archaeology these days involves the use of chemical analyses of various archaeological materials to extract more information about the societies that used them than is apparent just from looking at them. The oldest and most established type of research like this is radiocarbon dating, which has historically been used less in the Southwest than elsewhere because it’s both expensive and less precise than tree-ring dating, which was invented in the Southwest and has been extremely important in the study of its prehistory. Lately, however, archaeologists in the Southwest have been using radiocarbon more and more, since it can be used on anything organic (useful for sites which produce no datable wood but plenty of other organic material) and it’s been around for so long that the dates are considered very reliable. They’ve also begun to use some other techniques that are newer but have enormous potential, which is already starting to be realized, to illuminate aspects of the past that have been the cause of much debate. 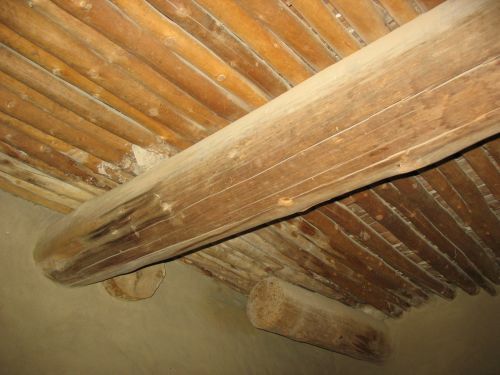 The most important of these is strontium isotope analysis, which we’ve seen before in the analysis of the wood brought to Chaco for architectural use. Like radiocarbon dating, strontium analysis is based on looking at the ratio of two isotopes of an element, one of which is stable and the other of which is produced by the radioactive decay of another element and therefore varies. Unlike radiocarbon, however, strontium cannot be used for dating on archaeological timeframes, since the half-life of the radioactive decay process involved (the conversion of rubidium-87 to strontium-87) is 48.8 billion years. It can, however, be used to identify locations, since the amounts of strontium and rubidium in different areas vary a lot and strontium is absorbed unchanged by organisms from their environment. Thus, in theory, one could test an organic artifact for its strontium ratio, then compare that to the strontium ratios of the water or soil in various places where the artifact may have originated and figure out where it came from. This would then allow all sorts of archaeological conclusions. Of course, it’s never quite that simple, as the case of the wood shows. It was relatively easy to use this analysis for the high-elevation types of wood that occur in relatively few places in the Southwest, but when the technique was extended to the very common ponderosa pine beams the number of possible origins increased so much that few definite conclusions could be reached. There is also the problem of making sure that the strontium ratios found in the archaeological material actually resulted from growth processes rather than contamination by later mineral deposits. Since this technique is relatively new, the methodology for it is not yet totally worked out, and not every attempt to use it ends up working. It’s pretty common, especially in sites like cliff dwellings and Chacoan great houses with especially good preservation of organic material. The Anasazi depended heavily on corn for their diet, so there are corncobs all over the place. It grows quickly. This is not important from the perspective of strontium analysis, but it means that radiocarbon dating can provide a very accurate range of dates within which the corn was grown and eaten. This is in contrast to slow-growing plants, such as trees, which have the problem that the part tested may happen to be much older than the date of use. The combination of accurate dating with strontium-based source determination makes corn a very powerful source of information. It bears directly on a variety of important cultural questions. Since corn was the main source of food for the Anasazi, finding out if they were growing it themselves or importing it from elsewhere has major implications for models of cultural systems and their means of support. This is a longstanding issue in the study of Chaco specifically. This particular paper addresses several issues, both substantive and methodological. Substantively, Benson analyzes a set of corncobs excavated from the Gallo dwelling in the Chaco campground in the 1950s and adds the data derived from them to the data from earlier studies of cobs from this site as well as from Pueblo Bonito and Chetro Ketl. He also reports on strontium isotope ratios from several agriculturally productive areas of the Zuni Reservation and adds them to the previously reported data from other parts of the Colorado Plateau. He then combines this new information with the previously reported data to draw some specific conclusions about the sources of some of the cobs. Importantly, however, he does not come to any conclusions about the sources of the newly analyzed Gallo cobs. The reason for this lies in the methodological side of the paper, which may be the most important in the context of overall research on this topic. The cobs Benson reports for the first time here, unlike the previously analyzed cobs, were not burned, and part of the purpose of this research was to see if the procedures used to prepare and analyze the burned cobs could be used for unburned cobs as well. As it turns out, they can’t, and the strontium ratios from the unburned cobs appear to come from post-depositional mineral contamination rather than growth conditions. This seems to be because the act of burning effectively “seals in” the trace minerals in the cobs, protecting them from contamination. While this result is somewhat disappointing, in that it means that the strontium data from the new cobs can’t be used to draw any conclusions, it is important in informing others that if they want to do this kind of research on unburned corn cobs they need to come up with new procedures. In the course of doing this analysis Benson also uses some data on recent experimental growing of Pueblo varieties of corn in Farmington that provides valuable reference material on just how closely strontium ratios in corncobs can be expected to correspond to the ratios in the soil and water in the area. The answer is closely, but not perfectly, which is also useful information for future researchers. Despite those issues, however, this paper does include some important substantive conclusions. Although the new cobs couldn’t be used for strontium analysis, they did produce radiocarbon dates, which correspond very closely to the dates on the earlier Gallo cobs as well as some of the ones from Pueblo Bonito and Chetro Ketl. Interestingly, these dates all cluster tightly around the AD 1180s. 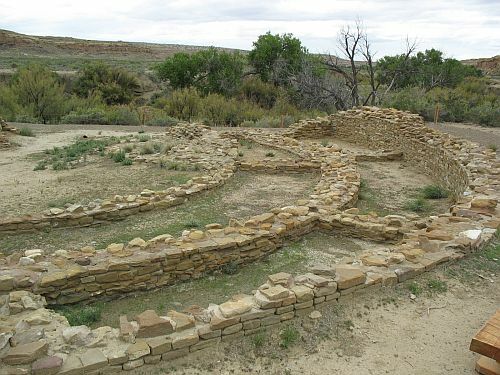 As Benson points out, this is after the major drought of the mid-twelfth-century, which is generally interpreted as marking the “collapse” of the Chaco system and the possible depopulation of Chaco Canyon. It has long been known that the canyon was occupied later, from the late twelfth century until the total abandonment of the region during the “Great Drought” of AD 1276 to 1299, but it’s unclear if the population at that time consisted of a remnant from the earlier Chacoan occupation or a reoccupation by people from elsewhere who may or may not have been descended from the earlier Chacoans. In any case, whoever the people were who lived in the canyon in the 1180s, these are their corn cobs. They didn’t grow them, though. In what is probably the most interesting conclusion of Benson’s paper, and certainly the most surprising, he goes through a careful analysis of the strontium data, excluding the data from the unburned cobs, and finds that the values from the cobs do not overlap with any of the locations in the Chaco area, either in the canyon or around it, that have been tested. It’s certainly possible that they come from somewhere nearby that hasn’t been tested, but at this point a lot of potential growing locations in and around the canyon have been analyzed, so there aren’t a whole lot of additional options. It’s not a very promising area for agriculture, after all, and pretty much all of the obvious places have now been tested for strontium ratios. So if these cobs didn’t come from Chaco, where were they grown? Benson compares their strontium ratios to data from several areas in and around the San Juan Basin: in addition to the newly reported Zuni sites, these include Lobo Mesa, the Red Mesa Valley, the Rio Puerco of the West, the Defiance Plateau, Chinle Wash, the Four Corners area, Mesa Verde, the Totah, and the Dinetah. This covers almost the whole area once occupied by Chacoan outliers, and several places beyond. The cob ratios turn out to overlap considerably with one of the Zuni areas, the Mesa Verde/McElmo Dome area, the Totah, the Defiance Plateau, Lobo Mesa, and the Rio Puerco valley. For some reason Benson doesn’t mention the Puerco in the text of the article, but in the figure showing the boxplots of the values for the various regions it clearly overlaps a bit with the cob values. Unfortunately, the strontium analysis itself doesn’t provide any way to choose which of these areas is the most likely source of the corn. Any of them is consistent with the evidence. Benson therefore turns to other lines of evidence to narrow down the choice. He eliminates Lobo Mesa and the Defiance Plateau because of evidence that they were not occupied during this period; he doesn’t go into a whole lot of detail on what this evidence is, which is unfortunate. As I mentioned above, he doesn’t discuss the Puerco at all, which is also unfortunate. This leaves Zuni, the Totah, and Mesa Verde as the remaining options. These are all areas that had Chacoan outliers during the height of the Chaco system and probably experienced immigration of people from Chaco after the system’s collapse, and they were all home to significant populations during this relatively wet period, so they are all plausible sources of corn imported to Chaco. 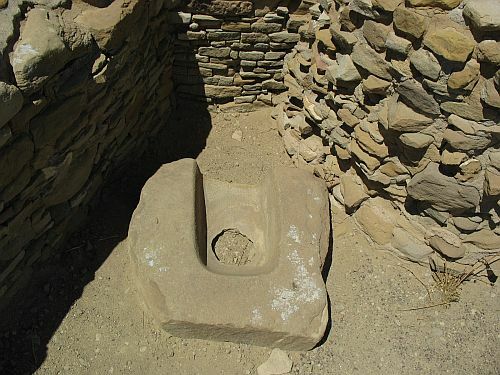 Benson concludes that the Totah is the most likely source based on the fact that it is the closest of the three areas and the one that seems to have had the strongest connections to Chaco, and while he acknowledges that this is little more than a guess, it sounds plausible enough to me. Certainly Aztec, which is often interpreted as a successor to Chaco in some sense, was a major center in the late twelfth century, as was Salmon, and the material culture of the people living in Chaco at the time shows considerable influence from areas to the north (although it’s not entirely clear how to interpret this). 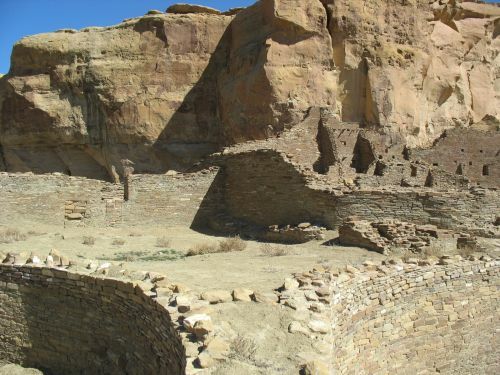 This paper is part of a growing corpus of data, much of it contributed by Benson, showing that the inhabitants of Chaco at various times did in fact import corn to the canyon. This seems to largely settle one of the longstanding disputes in Chacoan archaeology, and it further points out the pointlessness of trying to estimate the population of the canyon by first estimating its agricultural potential. What remains puzzling is how this system would have worked, and why. Beyond the obvious question of who was supplying the corn, which is partially addressed in this paper, the question of what leverage the canyon inhabitants would have had to get those people to supply them remains open. This paper, in fact, seems to raise more questions than it answers in this respect. While during the height of the Chacoan system it is relatively easy to come up with theories for how the canyon inhabitants could have acquired supplies from the surrounding area, in the post-collapse period, when the canyon population was tiny and regional importance had clearly shifted elsewhere, explaining how the few people left at Chaco managed to get others to grow food for them becomes a daunting task. It’s this sort of challenge, however, that I think makes Chaco so fascinating and ensures that it will continue to be a place worth studying for a long time to come. Chapter 9 of The Prehistoric Pueblo World, by Keith Kintigh, focuses on the Cibola region, defined here as a rather large area of west-central New Mexico extending into Arizona. 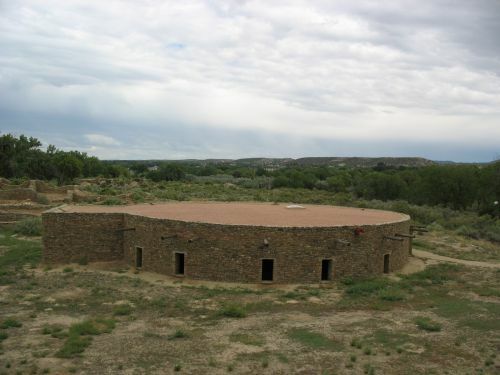 This region is of particular interest in the study of Puebloan prehistory because, like Hopi, it was one of the few parts of the Colorado Plateau to still be occupied when the Spanish arrived in New Mexico in the sixteenth century. 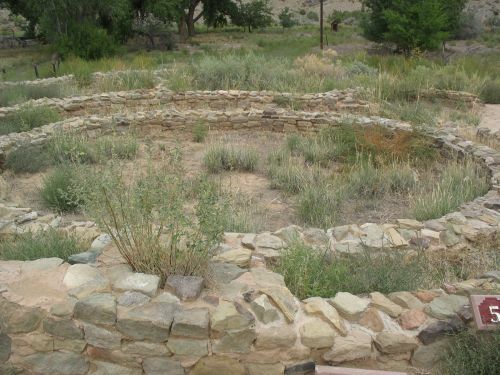 What the Spanish found were several small pueblos collectively known as Zuni. The colonial rumor mill had hyped these villages up into the famed “Seven Cities of Cibola” with their untold riches, so the first Spanish explorers were mightily disappointed to find how poor and isolated they actually were. 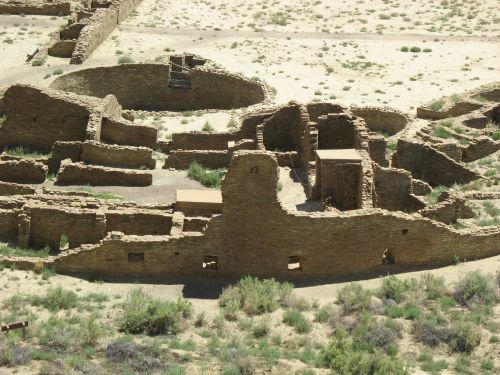 Later events, particularly the devastating effects of epidemic disease, resulted in the consolidation of the pueblos into one, originally called Halona but now generally known simply as Zuni Pueblo. That’s what happened after the Spanish arrived, but what happened before? How did Zuni end up in the condition it was in when the Spanish found it, and what happened to the substantial and widespread Pueblo population of the Colorado Plateau that is so apparent in the archaeological record from the time of Chaco? Kintigh’s answer, ultimately, is that it’s hard to say. He takes a very cautious and careful approach to the methodological issues involved in the study of this region, and is quick to point out several times the problematic nature of the data. This is a very large region, one of the largest covered by any of the chapters in the book, and only a few parts of it have been studied in any sort of depth. As a result, while certain areas (such as Zuni itself) are fairly well-known, there are huge parts of the region that have been surveyed minimally or not at all. This makes conclusions about regional dynamics extremely problematic, and Kintigh shies away from making any firm ones. Another problem with the data that Kintigh mentions involves chronology. While there are some tree-ring dates from the region, most dating of sites comes from ceramic sequences, not all of which are totally secure and most of which are pretty imprecise. This allows a rough sorting of sites into different periods, but makes detailed examinations of site occupation durations and dynamics nearly impossible in most areas. Despite these rather large problems with the data available, certain broad trends are apparent in the parts of the region that have been studied. These generally track the changes seen over time in the rest of the Plateau, with the Chacoan era marked by great houses and loosely clustered communities of small houses and the later periods marked by increasing aggregation into large pueblos, culminating in the apparently total abandonment of all areas except Zuni by 1400. There are, however, some aspects of this process in the Cibola region that stand in contrast to what was happening elsewhere. For one thing, while the region does show some sort of involvement in the Chaco system and there are both Chacoan great houses and dispersed small-house communities, the great houses and communities don’t seem to be associated with each other. 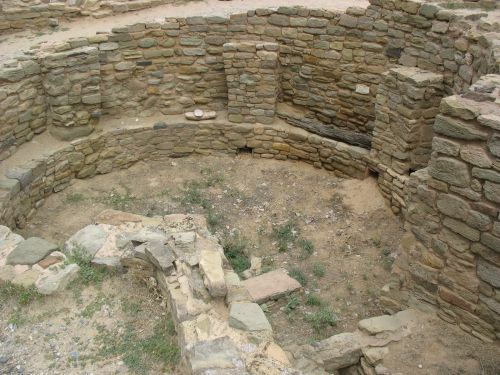 This is in stark contrast to other parts of the Chacoan world, where great houses were either built in the midst of already established communities or founded in unoccupied areas accompanied by newly established communities. This suggests, perhaps, that the nature of the relationship between the Cibola outliers and Chaco was different from that seen elsewhere, but beyond that it’s hard to say what was going on here. In the post-Chacoan era after AD 1150, the existing communities seem to have become denser, but there is quite a bit of variation in both size and density of roomblocks. Some of the more clearly defined communities from this period have great houses, but not all do. 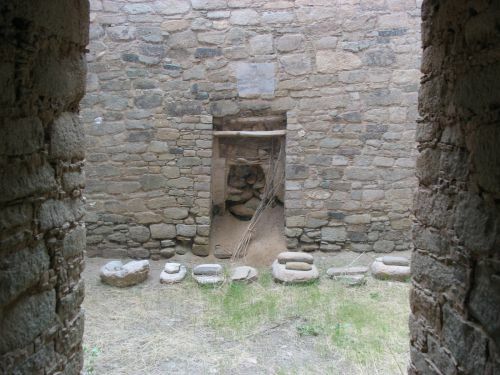 In notable contrast to the Chacoan era, there are no isolated great houses during this period. This is more typical of the pattern seen elsewhere during Chaco’s heyday, and it is again unclear why it only developed after the decline of Chaco in this region. It may have something to do with the apparent persistence of certain Chacoan ideas in the Cibola area into the post-Chaco era, a characteristic also seen in the Mesa Verde region. After 1250, the Cibola region witnessed a clear shift of the population into aggregated pueblos, and the small sites seem to disappear entirely by 1300. This is quite similar to what was happening elsewhere on the Plateau at the same time, particularly in the Mesa Verde region. Also similar is the apparently short occupation spans of most of these sites, although the crudeness of the chronology makes detailed study of this difficult. Also obscured by chronological problems is the nature of the aggregation process in the first place. These sites, again like those to the north, are mostly at higher elevations in areas suited for runoff-based agriculture. Some of these aggregated sites persisted longer than those in many other parts of the Plateau, but they too were empty by 1400, when there seems to have been a complete abandonment of most of the region and a move of the remaining population to lower-elevation sites along the Zuni River and its tributaries. The nature of the change suggests a shift to a system of agriculture based on riverine irrigation. This process resulted in the establishment of the villages that the Spanish would encounter later. These trends are apparent enough even given the problematic data, and the parallels with other regions are intriguing, but the reasons for the patterns seen in the archaeological record remain difficult to discern. Kintigh considers various issues possibly involved in the processes of aggregation and abandonment, including environmental change and warfare (for which, unlike Steven LeBlanc, he sees little clear evidence), but in the end declines to make any definitive pronouncements. This is understandable given the nature of the data, but the importance of this region for understanding the dynamics of change on a larger scale makes it very desirable to see an increase in both the quantity and quality of data available. As one of the very few surviving communities from the Colorado Plateau’s long and turbulent past, Zuni surely has lessons to teach about that past. Unfortunately, at this point they remain obscure.